While paddling along the shore, it’s always tempting to stop at a dock. Docks are a great place to take a break and stretch. 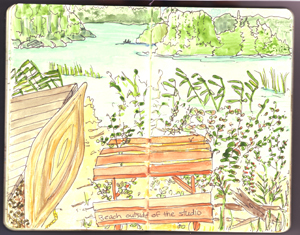 On French Lake there’s an inviting dock alongside the Artist’s Studio. 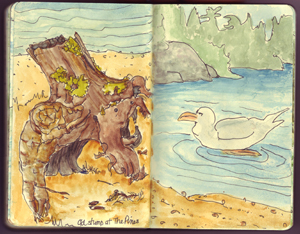 I spent some sunny days sitting at the picnic table and painting my drawings. And by the way, I am between canoe trips and taking a break to add this post. I am back in the Canadian Shield and loving it! I always enjoy paddling my canoe as close to the shore as I can. It has little to do with the fear of a big lake… unless the wind is howling and the whitecaps are kicking up! Rather, it’s all about the interesting things that also like to be close to shore. Tree stumps on their way to becoming driftwood… gulls taking a rest from the wind and sun… ancient rocks with a century of wear on them… a great way to spend a lazy day on the water! 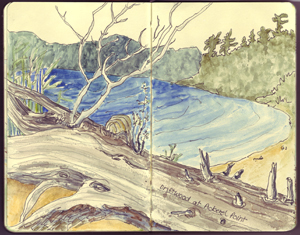 No matter how engaging the forest or the campsite, when I am on a canoe trip, I feel a pull to the water. There is a sense of magic in the rhythm of dipping that paddle into the lake and feeling the canoe shoot ahead. I am always excited to leave my campsite or portage to start the next leg of the journey. And if I am lucky, I just might get a tailwind to help me out!